It's another busy month and I'm supposed to be working on our state sales tax return. But I also need to do a blog post, which I'd much rather do. It seems as if I've been painting more gouache pieces lately. I've had some short painting times at our plein air locations for one reason or another and gouache seems quicker to me. And also, since taking the workshop given by Joseph Zbukvic my watercolor painting seems a bit confusing. I'm still processing what I learned and trying to integrate it into my own way of painting. As one friend said, maybe it's a little of right brain vs. left brain. I think that sums it up perfectly. I've been inspired lately to try some still lifes. 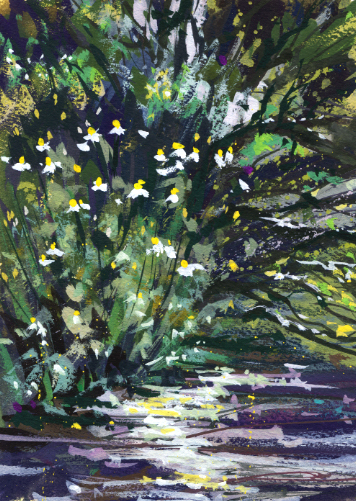 I painted this gouache piece before the workshop, having in mind to add it to the show our paint-out group is having this month. When I saw these onions at the local farmer's market with their long, dried stems I had to paint them. More still lifes to come! Last fall I painted in Central Park in Pasadena which has a great view of the old Castle Green Hotel (1887). I posted my two paintings from those two paint-outs in Castle Green. The hotel is very distinctive and has features which are hard to paint so that they look right. I don't usually try to paint things in an exacting way but this hotel needs to have its character looking correct. The plein air group that is newest to me met a few weeks ago in Central Park. The park covers a whole city block and has some nice features. It's got horse shoe pits and two lawn bowling courts. I thought instead of trying to paint the difficult hotel, maybe some lawn bowling would be fun to paint. People are usually there playing games. But, our small group all stayed near the north end of the park near the hotel and I wanted to stay with the group. There's a nice rose garden with some old brick buildings across the street. That view might have been fun to try but that whole side of the park was fenced off for some construction. I got a late start so I painted a small gouache. 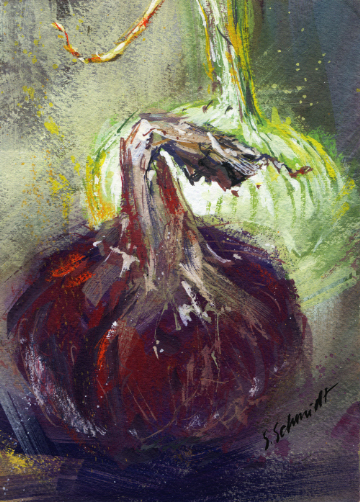 In some ways gouache is more forgiving than transparent watercolor, perfect for the hotel. This paint-out group, The Plein Aires, is the one having the gallery show this month. At the reception I was very very surprised to see my second painting of the Castle Green Hotel with a red "sold" dot! My first! I've visited Chinatown in downtown Los Angeles for as long as I can remember. It's a memorable place when you're a child. There was even an organ grinder with a monkey that collected money, and there still is a big wishing well. The current location was built in the 1930s and Hollywood film set designers had a hand in the design. It was seen as a tourist attraction, a Hollywood version of Shanghai. The buildings have been kept up with their neon edged dragon roofs, and it's very festive year round with many red lanterns. Of course Chinese New Year is a big event there. I've taken photos many times over the years in Chinatown and when I started plein air painting I hoped to paint there with a group. 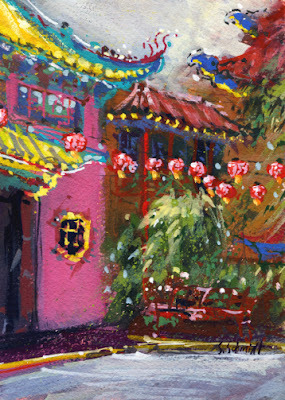 It turned out that last month two paint-out groups had Chinatown as our location. I was so happy to finally have the opportunity. 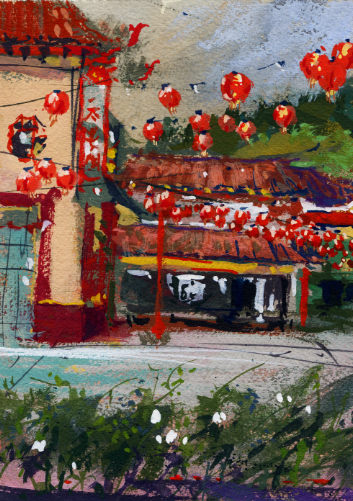 Since it's pretty hectic at Chinatown, or at least there is so much to see, that I thought I would just do a small gouache both days instead of trying a watercolor too. It turned out that on the Thursday we painted there, they were pressure washing the streets and sidewalks. The Chinatown streets have been closed to cars for years but there was a power washing crew and truck parked in front of the colorful buildings. Oh well, inconveniences are part of plein air painting. We worked around the crew, but our painting time was even shorter. The noise was awful so it was such a relief when they finished. Some of the group had a Chinese lunch after painting. Maybe next time! The pink building was Hong Kong restaurant. 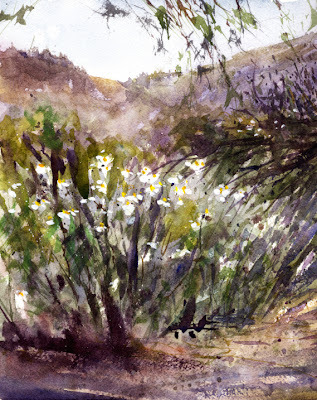 In June I posted two paintings of the Matilija Poppies that are so spectacular in Matilija Poppies!. 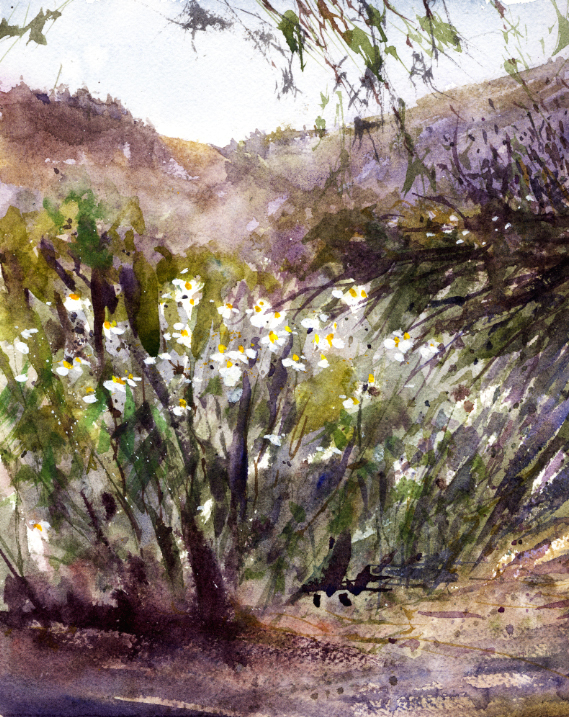 I went with groups on two more paint-outs with the blooming white poppies as our subjects. Time to post the watercolor and gouaches! There is a big cluster of the special poppies growing in Eaton Canyon in Pasadena. I painted a watercolor and a gouache the Friday the group was there. The next day the Saturday paint-out group went to the lower Arroyo Seco in Pasadena to see another area where the poppies are growing. Those were the most gorgeous of the big poppy areas I saw this season. The white poppies were the largest, most ruffled, most fluffy, and in the best condition. Luckily for us painters both days were overcast since the poppies like to grow in full sun. They don't like to be under trees as some of us painters do! The bees really love the poppies as well and were very busy both days. 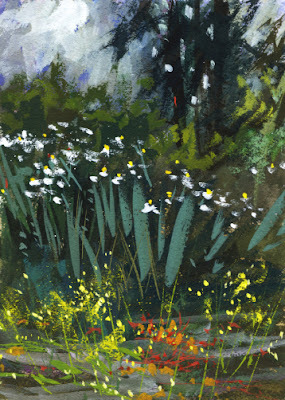 I painted a quick gouache before the sun got too hot and before the bees chased us away. The Arroyo poppies are across a wash from the Lower Arroyo Casting Pond. It's so calm and such a pretty green color. It's begging to be painted some day. I'll include a view of it from the drive down into the pond area. The La Loma bridge in the distance. 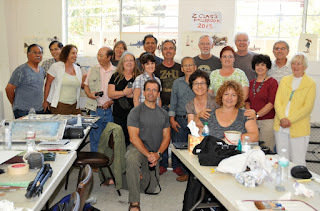 It's taken some time to wind down from the week-long workshop with Joseph Zbukvic in Fallbrook, CA. As I've painted on a few paint-outs since then, Joseph's tips are on my mind. Now just to put what I've learned into practice. Looking through my pages of notes, some Joseph quotes jump out like, "Watercolor puts you in your place!" "Speed is good, haste is Not!" As I mentioned in my last post, Z Workshop! Part1, after Joseph's demos in the studio, we then tried to paint the same scenes ourselves. But twice we went out plein air painting and chose our own subjects to paint. I'll post my two watercolors here. After we watched Joseph paint a street view just outside the art school, we were on our own. The view he painted was intimidating to me so I chose the car wash across the street. Another quote, "If your subject is wrong, you're Doomed!" So true. When Joseph came by to see how I was doing he gave me some great advice to narrow down what I had in mind and simplify. He was encouraging when he saw the piece almost finished. Not so much the way he would do it of course, but I learned a lot. The next morning we all met at a beautiful property in the hilly vineyard area. After watching Joseph paint a gorgeous view of the valley, we were free to choose our subjects. "Impact and illusion of depth through contrasts of edge and tone." "You must be in the moment. Don't paint a picture." I had fun with this view and Joseph seemed to think it was OK. He warned about judging a plein air piece when you're out in nature since they can't compete. More good advice. The workshop was so much fun and I learned so much from Joseph. He's such a down to earth person. He rode a borrowed bicycle to the studio every day. And he invited us all to the local pub after class each day. I went once and he passed around his sketchbook. Wow. I'm ready for the next time he comes to California! In June I had the amazing opportunity to take a week-long workshop given by Joseph Zbukvic in Fallbrook, CA. It's still hard to believe I was there with the world's best watercolor artist, in my opinion of course. Not only is Joseph an amazing watercolorist but he's such a charming person and excellent teacher. Joseph was so generous, telling and showing us everything about his specific techniques. He painted at least two demos a day after which we tried to paint the same scenes. 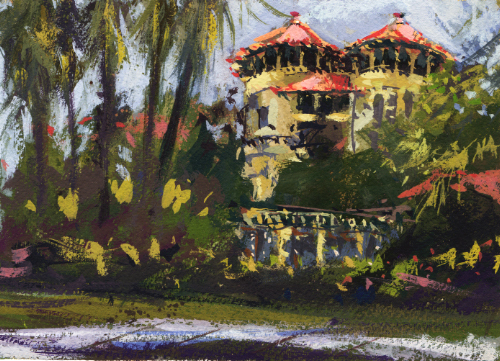 We painted outside on location twice with Joseph, getting to see what choices he made for the view he was painting. The weather was very warm or we may have had another paint-out or two with him. The week started off with some basics of Joseph's techniques, then morning and afternoon paintings. His demos for us to try started off "easy" with landscapes, a few farm buildings, and cows, mostly "free shapes" as he calls them. My cows need more practice! As the week progressed, Joseph's demos got more involved. We tried beautiful street scenes in Paris, in Melbourne, and a canal in Venice. I did nine paintings. Our last painting after his demo was of a beach and pier in Australia. He said he saves the "easier" beach scene for the final day. We all did better with it and felt more accomplished by Friday. I'll post my Australian beach and my try at the Melbourne street below. Part 2 next, Z Workshop! Part2! My watercolor of an Australian beach after Joseph's demo. Joseph just spoke generally about our progress. My watercolor of Melbourne after Joseph's demo. Joseph is setting up his demo for us to follow. Some of his basics, always stressed, Mr Bead is No. 1. What a nice group of artists we had! It was July 4, 2012 when I started this blog! I really appreciate everyone who has come by here in the past twelve months. It's been very encouraging to have visitors. After one year, the blog is still so much fun, and the paintings continue! The most recent plein air group I joined is a great group of artistic people. I ran across the group one Friday morning, painting at Arlington Garden and asked if they would mind if I joined them the following week. One of our members, Liz, lives on a street in South Pasadena that is lined with Jacaranda trees which I wrote about in my post Jacarandas!. 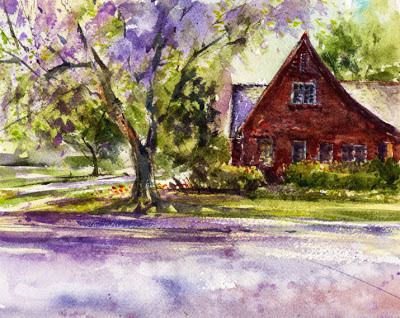 Liz kindly invited the plein air group to paint at her house when the trees were in full bloom with their purple flowers. I found a spot by the curb, in the fallen purple flowers, across from the shaded north side of Liz's beautiful brick home. Purple flowers continued to fall in my palette and water. No problem! The diverse painting group, which began in 2004, decided to have a show of our artwork! It's scheduled for July 2 through July 31, 2013 at the Glass Room Gallery in San Gabriel. 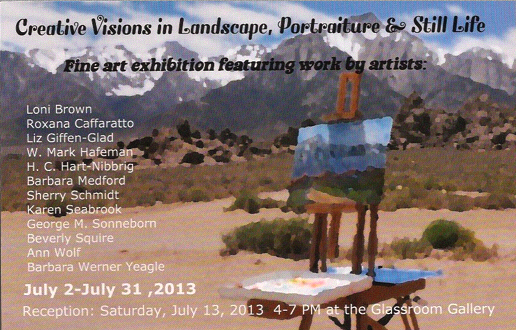 It's very exciting for me to be included with the group in this show. Who knows what the next year will bring!